Physical Security Online > Security > Personal safety > Is “Women’s Self-Defense” Necessary? I have conducted these types of classes, and see other schools promote these courses all the time. The question seems to be “Is Women’s Self-Defense Necessary” or is it a gimmick? The simple answer is that it can be either. It is not a cure all and is NOT a class to guarantee success in defending oneself. If it is promoted as such, then you should be wary of participating in it. 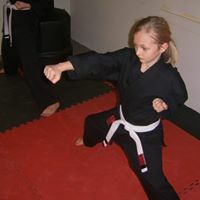 It is known by my students, and will be made known to any future students, be it in my Women’s Self Defense Class or in regular Karate Classes, that Martial Arts takes a LONG time to become proficient in. And, all because one knows Martial Arts, that does not mean that they can effectively defend themselves or win in a hand to hand combat situation. Martial Arts training provides the person defending themselves with training, and thus a distinct advantage against the person being the aggressor. These things are apparent to myself and my students. Is Women’s Self Defense even necessary, relevant, or worth-while? The question remains, however; is Women’s Self Defense even necessary, relevant, or worth-while? The short answer is – yes. 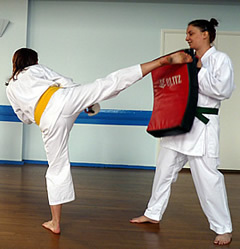 Women’s Self Defense is important, relevant, and effective for the target audience- women. Women and men, for the most part, differ in strength and physical ability. Women’s Self Defense Classes should, first and foremost, identify that, and work with the perceived “disability” of the female in a physical confrontation with a male, or even a larger female. Examples of non-effective, gimmick classes would be the price, for one. Exorbitant prices for a class, with flashy Instructors relying on flashy demonstrations should be a key indicator that the Instructors are there to show off THEIR skills, and collect YOUR money, and NOT to give you the skill-set to practice. If the Instructor does not want to get to know you, and identify what potentially makes you a target, it is likely that they care less about your ability to defend yourself, and more about getting you to sign up with their school. Be sure to understand what you are getting into. Make sure that there is actual instruction taking place, for example, the Instructor will be taking you through how to punch and kick and what areas of your attacker that you will be targeting. Ensure that there will be a block of instruction on improvised weapons and non-lethal weapons (pepper spray, etc.). It should also be emphasized that one or two class sessions is not the solution to your safety. These Classes should be designed to make you aware to potential problem areas in your life and give you the tools which you will need to continually work on to better be able to defend yourself. It takes time. Still, some people are of the opinion that providing training specifically geared for women is useless, even dangerous. I completely disagree. Providing a Self Defense Class especially for women is important because there is a special need, and abilities which women have that men do not, and these abilities need to be capitalized upon! I think that providing Women’s Self Defense Courses to first help specifically women become aware and more able to defend themselves and also generalized Martial Arts Instruction to a mixed Student Body to help all people become better individuals is absolutely necessary. I think that neglecting either of these aspects of Martial Training is dangerous and even irresponsible. The point of Martial Arts is to live better through Martial Arts. 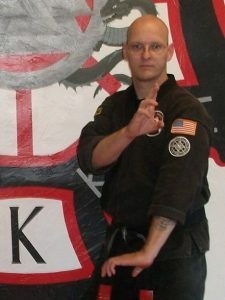 Not having to ever defend oneself, but having enjoyed the healthy benefits of Martial Arts is my goal as a Kenpo Karate Instructor. I never want to hear of, or see a fellow person being hurt in an assault. But if a person is assaulted unjustly, I simply LOVE to hear that they successfully defended themselves using Martial Arts.